From the present vantage point it hardly seems possible that in the earliest years of St. Hugo of the Hills Catholic School there were no subdivisions near the school. We are looking for pictures and any information that you might have about St. Hugo’s history. From our beginnings in 1940, St. Hugo of the Hills Catholic School is proud to have served thousands of students. St. Hugo of the Hills Catholic School began on September 17, 1940, with fifty pupils from kindergarten through the sixth grade. The first two weeks of classes were held in the chapel, as the workmen had not completed the building, and “brown bag” lunches were taken in the convent garage. Sisters, Servants of the Immaculate Heart of Mary, from Monroe, Michigan staffed the school. On October 27, 1940, St. Hugo of the Hills Catholic School was formally dedicated by Edward Cardinal Mooney. In 1941, seventh and eighth grades were added. In 1942, the first graduation from St. Hugo of the Hills Catholic School was held. Six young ladies graduated. St. Hugo of the Hills Catholic School has always been interested in a “total education” program. In the beginning, in addition to its fine curriculum, an athletic program was carried on by the classroom teachers or by a senior student. Father Wholihan Field was the place; volleyball, football, basketball and baseball were the sports. By 1949, athletic coaches for the boys and girls were hired. In September of 1953, the parish numbered about two hundred families. At this time the Ushers’ Club undertook a building campaign to enlarge the school and convent, and provide for church parking. The original school building was comprised of seven classrooms, an office, cafeteria and gym. Two classrooms, commonly called the “B” corridor, were added in 1955. A third, or “C” corridor, followed in 1959 with the construction of seven more classrooms. June 26, 1967, ground was broken for another school addition. The expansion provided nine more classrooms, a library, art room, science room, and a girls’ locker room. At this time a new convent was also proposed. With the new school facilities, nine new teachers joined the faculty bringing the total staff to twenty-eight. The seventies saw an influx of students to St. Hugo of the Hills Catholic School. Eight hundred forty students were enrolled, and a long waiting list for each grade was on file in the school office. The first graduating class of St. Hugo of the Hills Catholic School consisted of six students. The 1980 eighth grade class totaled an even 100. From the 80’s through today, St. Hugo of the Hills Catholic School continued to expand its facilities by adding the Fr. Esper Room, band room, expanding and updating the gym, and adding a new computer lab and head end room. In the winter of 2007, first grader Timmy Vachon was involved in a tragic ski accident. In memory of their friend and classmate, the families of the extraordinary Class of 2014 commissioned a statue. 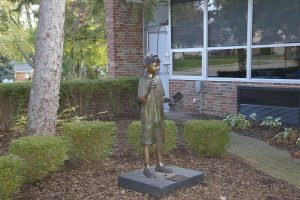 The Timmy Statue sits in the courtyard between the kindergarten classrooms and serves as a loving reminder of an unforgettable boy and our Lord’s promise of eternal life. The Timmy Vachon Foundation was founded by the Vachon family. The Foundation supports children to Never Give Up. To date, they have provided over 50 scholarships to Catholic school students and supported many diverse charities. To learn more about The Timmy Foundation please visit www.timmyvachon.com. As you walk through St. Hugo of the Hills Catholic School, you will see today’s students preparing to enter a global workforce undergoing a massive digital transformation. This shift is prompting St. Hugo of the Hills Catholic School staff to change how they think about not only what students need to learn, but how they should be learning. Digital transformation in the classroom cannot happen without high-speed internet connectivity. In the past 2 years, St. Hugo of the Hills Catholic School has updated the internet and added WiFi throughout the building to accommodate new technology. Students have access to several device types; Ipads, chrome books. 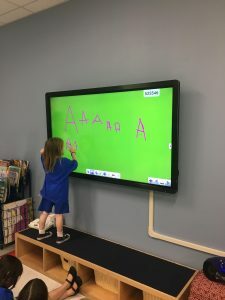 All Pre-K through grade 5 have interactive white boards in their classrooms. This is a huge shift in the digital landscape of students and teachers. The teachers are using this technology to broaden the scope of traditional classroom teaching. Teachers can use software to help them personalize learning so that each student can progress at their own pace. Teachers can connect their classroom to other classrooms using SKYPE; to work on joint science experiments; or to learn about communities different from their own. They can explore world-class museum collections and study primary resources from pivotal historical events. Using virtual reality to immerse themselves in cultural sites around the country or the world. The 2015-2016 school year marks the seventy-fifth anniversary of the school. 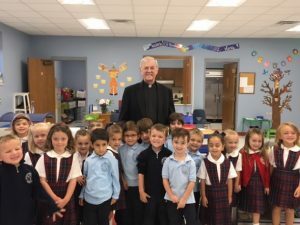 St. Hugo of the Hills Catholic School opens its’ doors to the first Kindergarten Readiness class. 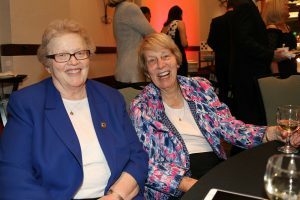 Sr. Margaret VanVelzen, IHM and Sr. Mary Ellen Keyes, IHM had a wonderful farewell mass after working at St. Hugo of the Hills Catholic School for over forty years. St. Hugo School parents are involved in the school as members of the PTG. Parents are also involved as members of committees such as Special Services, Hospitality, Library, Health & Safety, Athletics, Room Mothers, The Herald, the Viking Voice, Music, Publicity, Art. As one walks through St. Hugo School, you observe parent helpers in the school office, in the copy room, taking part in the reading lab program, in the library, in the health room, and on the playground assisting the primary grades.